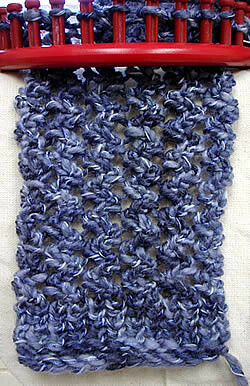 To make this scarf, I’m using one strand of a beautiful blue wool blend. (Yarn Bee Mosiac Twist, Color: Moody Blue) and the red loom. This stitch needs an even number of pegs, so I cast on 12 pegs using the crochet cast on. Then I knitted one row and purled one row. This gives the scarf a non-curling edge. I then knitted back and forth for six rows using a stitch that’s described in Isela’s pattern. 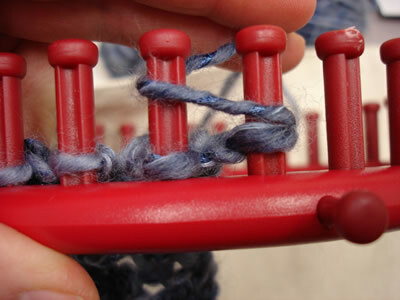 It’s a lot like the mock crochet stitch but instead of knitting three pegs at a time, you only use two. It’s an easy stitch to learn so I won’t describe it here. Then, I started doing the ziggy zag stitch. This is a fun, pretty stitch but it can be a little complicated, so I’m posting some pictures of how I interpreted it. Please let me know if I’ve made a mistake. STEP ONE: To start, you flat stitch two pegs. In this picture (ziggyzag1) I’m doing the flat stitch on Peg One and Peg Two. Knit Peg One and then Peg Two. Don’t pull your yarn too tight. 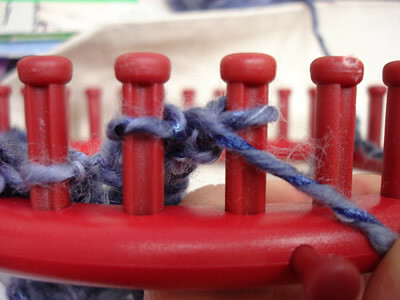 After you knit over Peg One and Peg Two, your yarn should be between Pegs Two and Three. STEP TWO: Bring the yarn BEHIND Peg Two, and then pull it in front of Peg One. Purl Stitch Peg One (ziggyzag2). Now, the yarn should be to the right of Peg One. 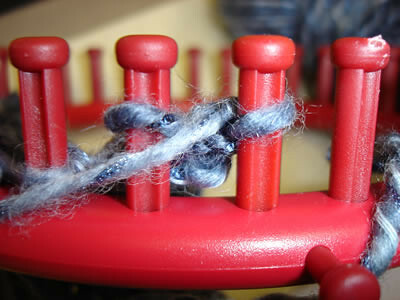 STEP THREE: Bring the yarn BEHIND Peg One and in front of Peg Two so your yarn is now between Pegs One and Two. Purl Stitch Peg Two (ziggyzag3). This is a really pretty stitch. It gives a zig-zagged edging, too, so you may want to include a border on either side of your project.